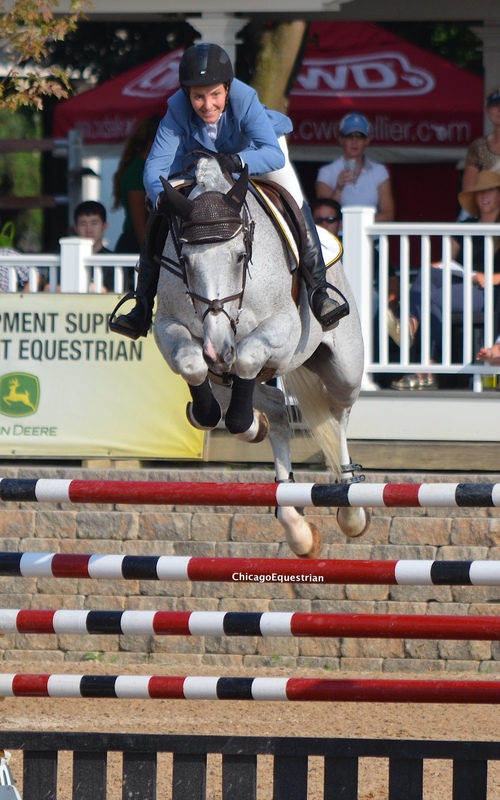 Wayne, IL – August 2, 2014 - A gorgeous Chicago summer day was just the icing on the cake at the $35,000 Prix de Lamplight during Equifest II at Lamplight Equestrian Center. VIP table holders enjoyed delicious food and beverages with an amazing view of the newly remodeled Grand Prix Ring. Other groups brought their own party and enjoyed the class with a challenging course designed by Mexico City’s Manuel Esparza. The crowds even cheered on the leadliners as they wandered about the course of jumps bigger than their ponies. 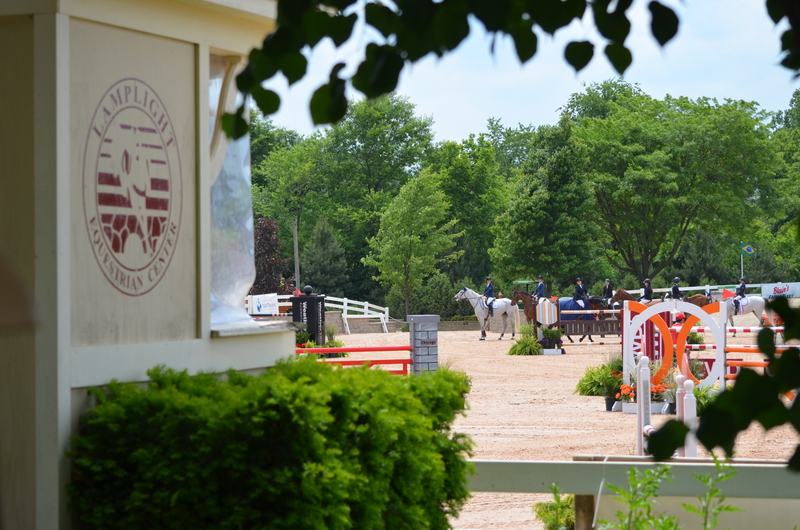 The course flowed back and forth through the large ring with a vertical, oxer, vertical triple combination across the diagonal and several oxer to vertical lines. The jump coming down the most was the narrow white vertical out of a line at the far end of the ring and a few rails in the triple combination came down as well. Seven of the original fifteen starters made it to the jump-off round where speed was the deciding factor. 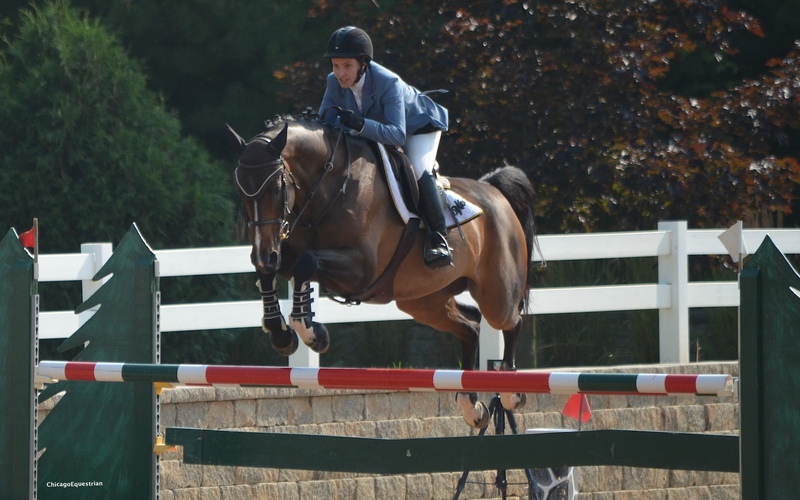 Tracy Fenney and Laura Linback each qualified both of their mounts for the jump-off along with Liz Atkins and Niro 8, Jennifer Waxman and Shakira and Dorothy Douglas with S&L Elite. 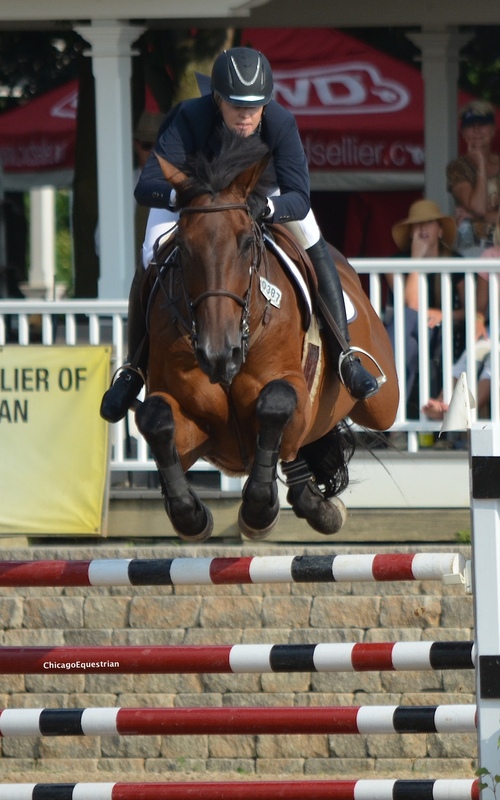 Liz Atkins and Niro 8 galloped to the second place spot. Returning first was Liz Atkins of Hampshire, IL and her Niro 8, who quickly set the pace for the rest of the field to catch with 36.956. Next to take a shot was Laura Linback of Mundelein, IL, and Whittaker MVNZ, who just missed catching Atkins by hundredths of a second with 36.972 and a clear round. Laura Linback rode Whittaker MVNZ to the third place prize. Tracy Fenney and MTM Centano. Then Tracy Fenney returned on MTM Centano and rode to a faster time than Atkins but had a rail, ending up with four faults and 36.083. That was just the first try for Fenney since she still had MTM Timon for another chance. Waxman and Douglas both left the ring with slower times and some jumping faults. Linback and Fenney had their second rides to go and Linback returned with a vengeance on HH Dauphin. Clocking in the fastest time of the night, 35.765, Linback gave it a great try galloping and bucking, but had a back rail for four faults. Laura Linback and HH Dauphin clocked the fastest time of the night. “I gave it a shot and went down trying!” said Linback, who was still sitting in second on Whittaker MVNZ for the moment. As the saying goes, Fenney saved the best for last as she galloped the track in a blazing 36.466 on MTM Timon by shaving the turns and being cautious to the Lamplight vertical for a clean round with her second try. 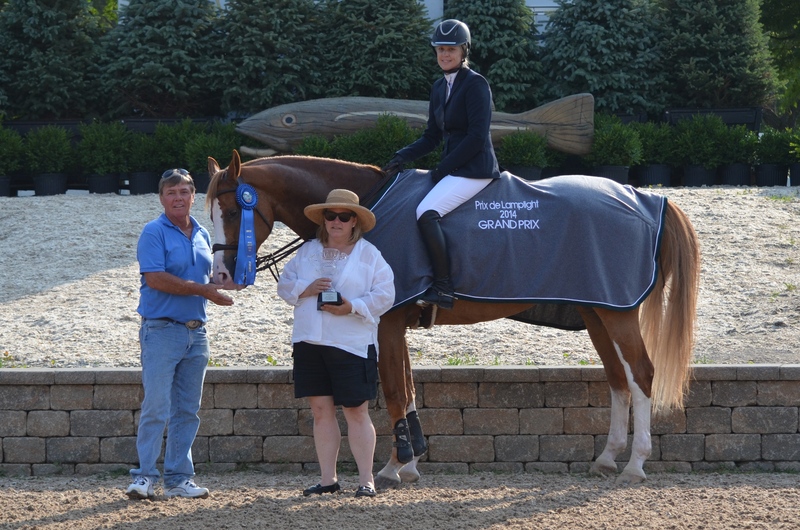 Lamplight owner Nina Moore presents Fenney, Mike McCormick and MTM Timon with the top award in the $35,000 Prix de Lamplight at Equifest II. And right is was as Fenney took the blue with MTM Timon, Atkins and Niro 8 finished second and Linback was third on Whittaker and fourth on HH Dauphin. Fenney and Mike McCormick came to Lamplight last month for the Showplace Spring Spectacular and made the trip back for Equifest for the Prix and Sunday’s Derby Day. 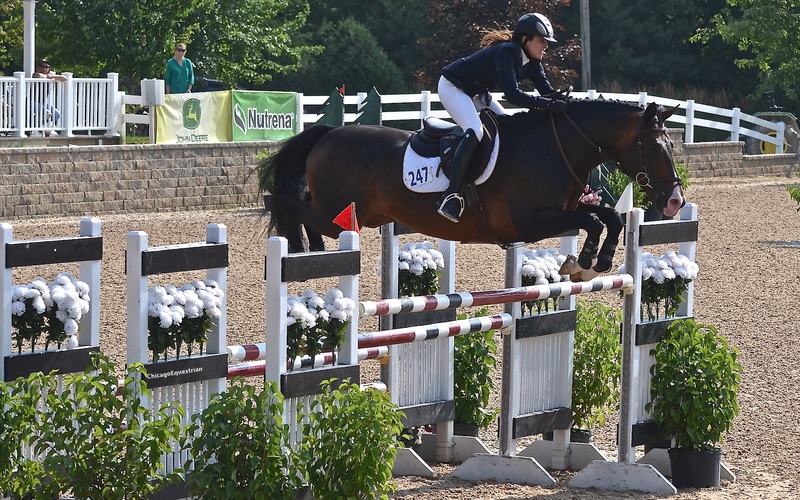 Fenney will compete in the $15,000 USHJA International Hunter Derby tomorrow before heading to Europe for a few days and then to Trader’s Point. Equifest II will finish the week with the International Hunter Derby and a $5,000 National Hunter Derby which will be live streaming on USEFnetwork beginning at 9:00am central time. The show will also award the leading Junior or Amateur Hunter Rider with a CWD saddle between the two derbies.